British Columbia’s commitment to the green building market is accelerating at a rate that would likely surprise even the keenest of observers, Vancouver’s Board of Change heard at a recent panel discussion. He was speaking in Yaletown in February on a panel focused on how governments, designers, builders and residents are dealing with the evolution of green building policies and initiatives. The event was hosted by the Board of Change, a business network which fosters balance in commercial sustainability, social responsibility, and profitability. The panelists agreed more red tape needs to be removed to allow for more green construction, and increased cooperation is required with designers, builders and residents to boost understanding about green buildings. But measurable progress is being made here. Last year marked a good time for green building initiatives, said panelist Robyn Wark, BC Hydro‘s sustainable community program team lead. Part of that response in B.C. has been the recent approval of the Energy Step Code. It’s a voluntary provincial standard launched in April 2017 which uses tiered criteria to improve on building codes to construct more energy-efficient buildings. The code establishes measurable, performance-based, energy-efficiency requirements for construction of residential and commercial buildings. Municipal governments can adopt these measures through their own policies and bylaws using various incentives such as density bonuses. So far, the District of North Vancouver, the City of North Vancouver and the City of West Vancouver have been the earliest adopters of the program. But dozens of other B.C. municipalities are consulting about the Step Code now, Wark said. Other green building programs including Passive House and Energy Star can be incorporated into the Step Code. 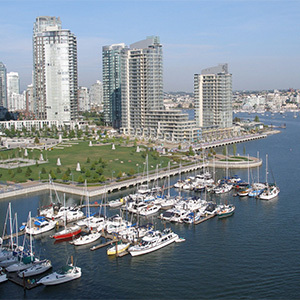 Vancouver is the only city in B.C with its own building code and has been meeting elements of the Step Code through its own Greenest City Action Plan 2020 and Zero Emissions Building plan. Panelists acknowledged the cost of green buildings remains a major question mark for people. Wark said a new paradigm is needed to think about green building costs and savings. She said her neighbour bought a Vancouver bungalow which had been built in 1929. The buyer replied that, since people had been living in the house for 90 years, it couldn’t be that uncomfortable. Over the decades, various aspects of the house — carpets, appliances, decor, finishing — had been upgraded. One of the leading programs in Vancouver has been Passive House, which focuses on designing and building a better building envelope to reduce energy consumption and heating demand. The application has been shown to reduce heating demands of a home in Canada by 90 per cent when compared to the national average for a non-Passive House home, said panelist Sandra Rohler, a Passive House designer and architect at Cornerstone Architecture. Passive House is already being used to construct houses, condos and apartments and various commercial buildings in Vancouver, she said. In fact, 20 per cent of rezoning applications in the City of Vancouver are now Passive House projects, making the city one of the early adopters in North America. “It’s happening, which is great,” she said. “Vancouver now requires all city-owned and all affordable housing agency projects to be Passive House certified, or if it’s an unusual building typology, we may look at another zero-emissions building code,” Pander said. “We’ve already got nine city facilities, either starting construction this year or starting design this year to the Passive House standard. “In Vancouver, we have over 1.2 million square feet of new development moving through city permitting that will be built to the Passive House standard,” he said.